Ford Motor Company was different back then (1992 time frame) than it is now. There is no way that what took place and what was approved then could take place today. I do not know why we decided to run a car at Bonneville, probably because we ran a Super Coupe out there. I do know that the manager for the program, Jim Kennedy, was behind the whole idea and supported the running of the car. Even though Jim and I didn’t agree on a lot of things, and I don’t think he ever liked me, he was good for the car line. He had a vision and tried to fulfill that vision. Now with the into, I’ll get onto the details. Once it was decided that we would run the car at Bonneville everyone was told to “optimize” their given subsystem (engine, transmission, axle, suspension, aero, etc.). The engine itself was truly a production Mark 8 engine that was just blueprinted. It had no cats and a dual exhaust. It was ran on dyno prior to installing it in the car and made 290-295 HP. It was truly a stock engine. There wasn’t enough time to put together a highly modified engine. We started working on this program about 2 months before the trials in Utah. The transmission was stock but we did search for rotating parts that had no imbalance and no run out on the shafts. Then we built the transmission with high clearance on the clutches and bands that would not be applied during the 3rd gear runs. The axle was changed to a 2.47 axle. We wanted to run in 3rd gear to have higher transmission efficiency. Anytime you have to turn a gear set, you are giving up power. Third gear is direct drive and you are not spinning any gears. So we figured we needed a 2.47 axle to run in 3rd gear. The air suspension, which normally lowers the car about 20 mm when you get above a speed, was set to lower the car another 25 mm so the car would drop almost 2” from it’s static ride height. 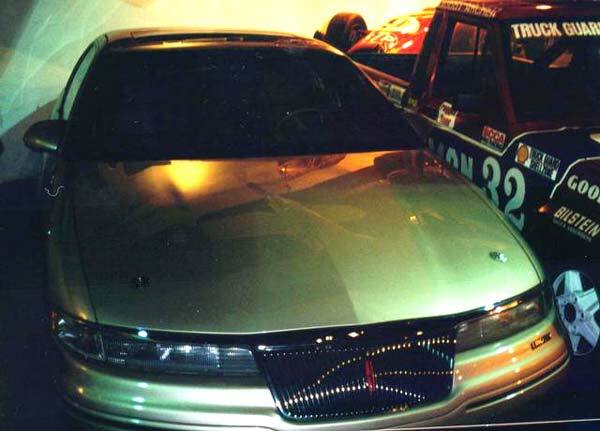 Aside from this, the only other changes to the car itself were removed rear brakes (for less drag), removed side view mirrors, some fabricated “belly pans” for under the car and some kind of air deflector behind the grill, and the skinny Bonneville tires. (Of course the car had a roll cage and a two-piece driveshaft). So now the car is built. But, Jim Kennedy says that we are not going to Bonneville unless we know for sure that we can capture the record for the class that it was going to run in. He said that we need to take the car out to Ford’s Michigan Proving Grounds in Romeo Michigan and run the car on the 5-mile oval. If it doesn’t go at least 175mph at MPG, we are not going to Bonneville. You would think that a Z rated tire would be OK to run on those speeds. After talking to Goodyear, they said they wouldn’t run the regular Z rated tire on that car at those speeds, we ended up putting Corvette tires on it, the Goodyear GSC’s, it was the only tire that they would guarantee on that car at those speeds on the asphalt track. So, we all go to MPG and they shut down the high-speed track and run the car backwards (counter clockwise) on the track. We stood, with a radar gun about ¾’s of the way down one of the straightaway. The first lap was only in the mid 150 mph range, a little disappointing. The next two laps had peak MPH’s of about 168. But, there was hope; the man operating the radar gun said he was sure his gun was off by 6-8 mph. So, add that to 168 and we have enough speed to send the car out west. (I really don’t believe his gun was off, but we really didn’t care, he said the car was at least in the mid 170’s and that was good enough for us). So now we are at Bonneville with the car. The altitude of the Salt Flats is about 4300 ft above sea level. That means our 290 HP motor would only make about 255-260 HP at the flats due to the loss of air density. But the wind drag is also reduced due to the lower density of the air. We rented an Aerostar chase vehicle for the car. We had an entire semi trailer filled with tools and stuff that we think we may need. The trailer was really nice, on the side is said, “Lincoln, what a luxury car should be” and had the Lincoln emblem next to the phrase. 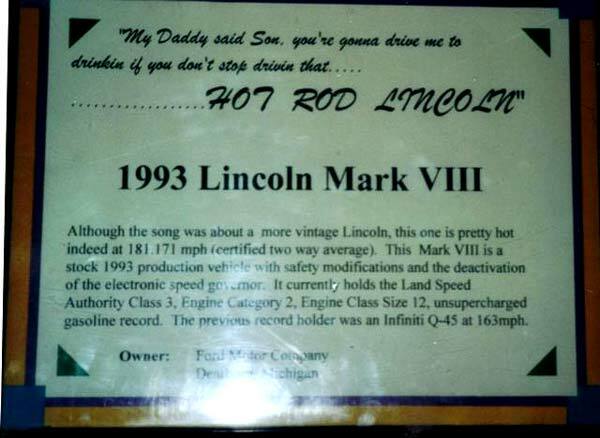 For some kind of liability reasons, no one from Ford could actually drive the car during record runs or attempts. So, they talked to the guy that drove the Super Coupe, Holly Hedrich, and he agreed to drive the car for us. Holly was a unique person to say the least. So, the first run in the car will be just the way it ran at MPG, the GSC tires, with side view mirrors and with rear brakes. Now at Bonneville you can start your run for the timed mile at two different points. There is the “short course” which is, if I remember correctly, a two-mile head start to the timed mile, and then there is the long course where you get about a 4-mile head start. The difference between the two has to do with what record you are shooting for and that particular sanctioning body’s rules. We started the first run on the short course. One of the guys that was there when Holly ran the T-Bird told me this; He’s a good driver but he’ll never make a full pass on the first run. He’ll come back and say there was something wrong with the car and that’s why he lifted in the middle of the timed mile. Well guess what, that is exactly what happened. He brought the car to the pits and said it wasn’t running right. Well, little did he know that we had the data logging equipment in the car and monitored pretty much every EEC parameter that was relevant for what we were doing. Myself and one other guy looked over the data and there was absolutely nothing wrong with the car. So, without a change, off he goes on the second run. This time the car runs in the mid to high 160’s, pretty much what it ran at MPG. With Jim Kennedy coming in the next day, we needed to find some speed or face an irritated manager. So, this time we put the skinny tires on it pulled the mirrors off and went to the short course starting line. The car ran in the low 170’s, which was good, but we really wanted a 180 MPH run. Well, when going over the data from the run, we realized that the car was still accelerating at the end of the timed mile. Now, it wasn’t accelerating really fast, but it was still accelerating. So, after talking to our guys and them talking to the sanctioning body, we found out we can run the long course and still qualify for the record we were shooting for. So, we lined the car up at the start of the long course, which was about 100 yards from I-80, and ran the car. This time it ran somewhere around 178 mph. We ran out of time to re-run the car to back up that speed, if I recall, there was an issue with the track. You must run the other direction within an hour of the previous run. So, this time we pulled the rear brakes off and went back to the long course. It was starting to cool off some since it was getting later in the day, we knew that would help. The car finally crossed the 180 MPH mark, running a 180.794. This time we knew we had to get it turned around and back in less than an hour. We made the trip to the other end of the track in our Aerostar, and then looked over the data from the run. The oils were hot. The transmission was over 250F; the engine oil was over 275F. I looked at the other calibrator that was there with me and we agreed, send it back down the track. The oil is hot, hot oil is thin oil, less parasitic drag. Also, it was starting to get kind of dark and cool. This time the car ran 182.694 on it’s one-way pass for a two way average of 181.717 MPH. We reached our goal, and only after one day, we still had a second day. I remember that they announced the speeds over an AM radio channel. And, after that second pass of 182.694 MPH, the announcer said, before telling the speed, that there were going to be a bunch of happy Ford engineers out there. There sure were. The second day should have been a disappointment, but after capturing the record on Saturday, there were no disappointments. We tried a few things to make the car faster. We lowered the car more, via the air suspension, it didn’t work. In fact, everything we did on Sunday did nothing but slow the car down. We successfully took our 183 MPH car and made it run in the low 170’s. But it didn’t matter; we accomplished what we set out to do. So, now it’s time to pack up, take a few photos and head home. Remember the nice semi trailer we had that said “Lincoln, What a luxury car should be!” Well, we got some white shoe polish and wrote after that phrase “fast, 182.694 MPH”. You can see that in the picture. The truck driver drove all the way home with that on the side. Probably the saddest thing of all this is that the Lincoln “brass” was really kind of upset with what went on. They did not want Lincoln to have a “racy” image and refused to use any of what we did out at Bonneville in advertising. It was one of the best times I had working at Ford Motor Company.